Stenbolone is an anabolic steroid. It is structurally similar to 1-testosterone. The route used to prepare the unsaturated 2 methyl androgen stenbolone provides yet a further illustration of the propensity for the formation of enolates at the 2 position. Thus reaction of dihydrotestosterone acetate with formaldehyde and dimethylamine gives the Mannich product. Hydrogenolysis of that product gives the 2-methyl derivative via elimination of dimethylamine. Bromination of the ketone leads to the 2-bromo derivative. 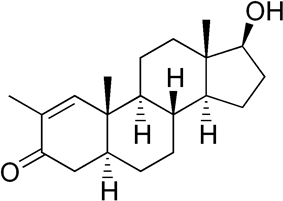 Dehydrobromination by means of lithium carbonate in dimethyl formamide (DMF) affords the androgen stenbolone acetate.